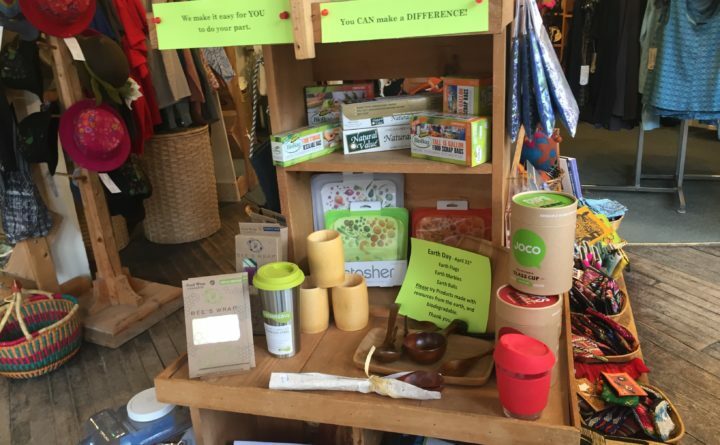 Throughout the Green Store on Main Street in Belfast, little notes can be found that remind would-be customers that they can make a difference. For 25 years now, the Green Store in Belfast has been a local institution. Where else would you find such diverse items as composting toilets, toxic-free paints, cheeky bumper stickers, sweatshop-free clothing, reusable cloth menstrual pads and much more? But unlike most Main Street institutions, this one began with a friendly poker game in Montville in the early 1990s. In those days, two then-married couples and Waldo County back-to-the-landers, Ellie Daniels and Bob Fenton and Bill and Pene Behrens, used to gather for cards and conversation. One night, they found themselves talking about natural food, organic gardening and living off the grid. There were few places to go to stock up for these lifestyles, which appealed to homesteaders and hippies alike and offered unique challenges. 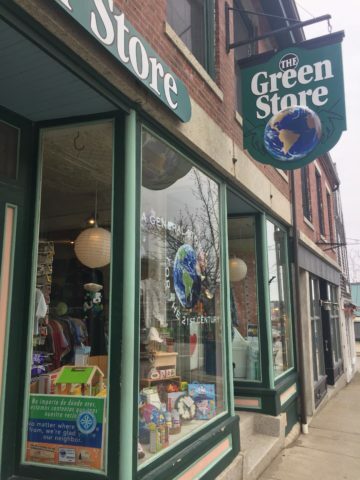 “Wouldn’t it be nice if there was one place to go to get all things environmental?” Daniels recalled thinking, and so the idea for the Green Store was born. The motto of the Green Store on Main Street in Belfast is "A General Store for the 21st Century." It took a lot of creativity and sweat equity to translate a good idea to a bricks-and-mortar store, and more hard work and adaptability to keep it relevant and vigorous for a quarter of a century. During the first year of business, Daniels and Fenton divorced, and Fenton was bought out by Daniels and the Behrens. In 2004, Daniels bought out the Behrens, and today, she is the last of the four original owners to helm the Green Store. Despite all those changes, many aspects of the business have stayed the same over the years. It’s hard to remember Belfast and Waldo County without the Green Store, said Alan Crichton, a member of the back-to-the-land generation who founded Waterfall Arts, a nonprofit art center located in Belfast and Liberty. At the beginning, each partner brought a particular passion to the fore. Perhaps most notably, Bill Behrens, who later co-founded ReVision Energy in Liberty, was interested in renewable energy, and Daniels, who worked for decades as a midwife and was the founder of Belfast’s Morningstar Midwifery, had a strong focus on natural health. They also launched a low-cost marketing campaign to see what the community wanted them to stock, putting placards on their children and sending them out to talk to people. In 1993, the friends secured a lease on the lower Main Street storefront that was being vacated by the Belfast Co-op, borrowed $38,000 from friends and family and waited to move in. The waiting was hard, Daniels said, because the Co-op’s move to their new, larger store (the current location on High Street) was very delayed. “We were freaking out,” she said. Finally, that fall, the Green Store opened. From the very beginning, they did some things differently than other small businesses. They had a computerized point of sale system even before email became ubiquitous. And from the start, they focused on explaining the sometimes-unique goods they carried. 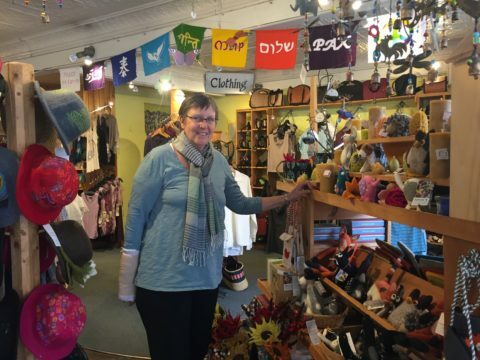 Ellie Daniels, the owner of the Green Store on Main Street in Belfast, reflects back on her 25 years of business. "We are ... sort of changing the world, one little step at a time," she said. It was, and has continued to be, a good one. They didn’t just sell new technology, they explained it so customers understood how to best use the items in their own homes. Many of the on-demand hot water heaters, photovoltaic panels and other sustainable energy solutions were cutting edge when they first came to the Green Store, but have since been more widely adopted and can be found in mainstream retail stores. In fact, in 2003, the alternative energy portion of the business was spun off by Bill Behrens. By 2008, it had grown into ReVision Energy, a full-service renewable energy contracting company that has branches in Maine, New Hampshire and Massachusetts. The Green Store was able to adjust to the change, Daniels said, and removing the alternative energy systems freed up space for other merchandise. In many ways, that was a good thing, as some of her humbler offerings actually are the most profitable things she sells. Although there was an effort made to open other branches of the store in Damariscotta and Brunswick in the 2000s, they ultimately closed. The Green Store seemed to work best in quirky Belfast, under Daniels’ careful guidance. She’s proud that over the years, the store has really helped people to realize off-the-grid and homesteading dreams, or has helped make on-grid lives more environmentally conscious. All without preaching to would-be customers who might be mulling whether they could actually do things like compost their kitchen scraps, or switch out their Ziplock bags for reusable food storage wrappers made from cotton and beeswax.